Figure 7.4. Proportion of samples giving a final result at each dilution on the Optilite analyser. Adapted from Walker et al. Binding Site instruments include automated dilution protocols for samples that give Freelite results that are out of range at the initial dilution (Sections 37.2 and 37.3). Walker et al. assessed the incidence of sample redilution for Freelite Optilite assays during routine analysis. κ and λ sFLC results were generated at the standard dilution in 83.12% (12,761/15,353) and 82.63% (12,790/15,478) of cases, respectively. A single additional dilution was required to give a final result in a further 13.33% and 8.70% of cases, for κ and λ, respectively (Figure 7.4). Similar findings were reported by Hitchcock et al., who identified that 87% of κ results and 94% λ results were generated at the standard SPAPLUS dilution. In practice, the number of samples that require redilution will be dependent on the number of samples from patients with monoclonal gammopathy. 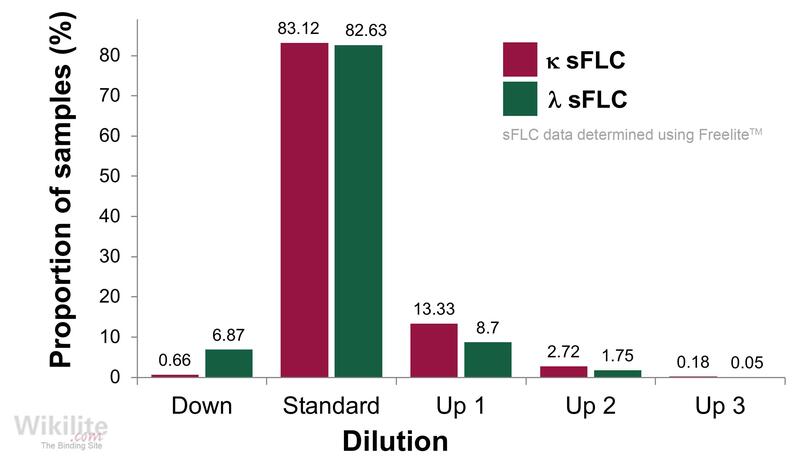 When the proportion of samples with monoclonal sFLCs increases, the frequency of samples with high results, and hence the number of redilutions will increase. Caillon et al. assessed the number of redilutions required to achieve a final result in a cohort of 113 LCMM patients. At baseline, only 11% and 5% of samples gave final results at the standard dilution for κ and λ, respectively. However, following 3 cycles of induction therapy, final results were generated at the standard dilution in 54% and 63% of κ and λ cases, respectively. Overall, the average number of redilutions required to give a final result per patient was 1.9. The authors comment that “laboratories should be reassured by the reduction in the need for redilutions in individual multiple myeloma patients after initiating treatment”. In summary, >80% of routine samples give a final result at the initial dilution on the Optilite or SPAPLUS. sFLC measurements on other platforms, such as the BN™II, may require additional dilutions as they do not include inbuilt antigen excess parameters (Section 7.5) and have narrow measuring ranges (Section 6.1). 3. Caillon H, Avet-Loiseau H, Jenner E, Moreau P, Attal M, Dejoie T. Laboratory performance of serum free light chain immunoassays in baseline and post-treatment samples of light chain multiple myeloma patients. Presented at AACC 2018:A-017a.